Portugal is not the first choice for major Islamist, far-right or far-left organizations seeking to carry out attacks or find new recruits. Occasionally, though, some of these radical groups do choose the country to make important contacts or to hide from the European authorities. In recent years we have seen several episodes of cells trying to regroup and planning operations in local hostels and cafes. The main threat is groups with links to international jihadism but, from time to time, the secret services and counter-terrorism police must also deal with local fascist groups that have formed in suburban areas near Lisbon, the Portuguese capital. Far-left groups too have gained some importance, mainly after the economic crisis between 2008 and 2011. Just as they do in many countries, the internet and social media spread ideology directly to the hearts and minds of the younger generation. Many young people are receptive as they are searching for new ideas beyond the old values of liberalism, social democracy, or socialism, among others. Traditionally, Portugal has no history of political violence. Even the Revolution of the 25th of April 1974 unfolded without riots and bloodshed. We are considered the fourth most secure country in the world. But the growth of tourism, a phenomenon which has intensified in recent years, has put the authorities on alert. In particular, the jihadist attacks in Paris, Barcelona and London led them to change their security measures. We are no longer known as the easy-going country of Europe. On the radical Islamist front, over the years we have had a dozen cases. One features Mohammed Emwazi, the man behind the mask who later became known as Jihadi John. In 2011 he travelled by car from London to Portugal with another man. At that time, he was already on the security radar in the UK. At present, sources in Portuguese counter-terrorism believe that Emwazi was financing jihad and preparing future trips between London, Lisbon, Istanbul and Raqqa, not planning an attack in Portugal. He was not arrested here but his contact in Lisbon still lives in Portugal. The authorities also suspect that some Portuguese jihadists from the Leyton cell in London had links with Jihadi John. Some years before, in Oporto, the second largest city in Portugal, the Polícia Judiciária (PJ, the Portuguese Police for Criminal Investigation) and the SIS (the Portuguese Secret Services) pursued the Dutch Hofstad cell, fundamentalist group based in Amsterdam. The authorities were mainly concerned about a young man considered as a “strong candidate for martyrdom” during the 2004 Euro Cup in Portugal. He had left a farewell letter to his family in Holland. In a major joint operation of the PJ and the SIS, whose details were revealed some months ago in a book written by a former spy, they arrested the jihadist and his group and sent them back to Amsterdam. Fortunately, there was no terrorist attack and Portugal reached the final in the football tournament. Another serious case is more recent. A former police officer from Morocco was accused by the Portuguese authorities of recruiting young Muslims in Lisbon and Aveiro, a small city in the central region, to fight for Islamic State between 2014 and 2016. Abdessalam Tazi’s cell worked all over Europe – it was active in Germany, France, Spain, and Belgium as well as Portugal. Abdessalam Tazi circulated easily in the streets of the capital, in the heart of the Maghreb community. He spent time in coffee-shops and delis talking, mostly with young people of the same nationality and creed. He acted as a sort of teacher, lecturing students and leading indoctrination. These kinds of radical preachers are common enough in France, Belgium or the UK. But they are rare in Portugal, so his presence attracted attention and one of his pupils warned the authorities. He was arrested last year and his cell was suspected of organizing attacks in France. Turning to the far right, we have neo-Nazi groups in Portugal and the threat fluctuates. There has been violence and some casualties. In 1995, a group of skinheads beat a Cape Verde citizen to death in Bairro Alto (Lisbon) and more recently fought against communist sympathizers in a nearby neighborhood. A PJ raid in 2017 inside their headquarter in Odivelas, near Lisbon, found guns, munitions and all kinds of far-right propaganda. Some of them were arrested but were then released immediately by the judge. In recent months, during the refugee crisis, some social media sites linked to these groups exhorted the Portuguese to protest against the Government policy of receiving people from Middle East and North Africa. But these far-right protesters do not attract high numbers of recruits. In comparison with other countries with big xenophobic movements, Portugal is still a peaceful oasis. However, we do have groups such as the Hammer Skins and the Hell’s Angels under close vigilance. In March, the Hell’s Angels showed that they can cause a very great deal of damage when they assaulted their rivals Los Bandidos in their territory. The PJ arrested almost 60 people, but nobody believes that the Hell’s Angels will be quiet for much longer. At the opposite extreme on the far left, the situation is less clear. Apart from the NATO conference protests in 2010, when thousands of Black Bloc militants from all over the world camped in Lisbon, far-left Portuguese militants prefer to occupy old buildings rather than destroy or burn them. The secret services did notice some Portuguese sympathizers inside the violent protests against the G-20 summit in Germany last year and there is a lot a lot of propaganda in social media and on the internet. But it seems there is nothing very serious to consider. The Institute for Economics & Peace, an international think tank, considers Portugal the fourth most secure country in the world, after Iceland, New Zealand and Austria. In 2017, we were in third place. And the terrorism alert is moderate. Nonetheless, between 2014 and 2016 the authorities were worried about the small but influential group of Portuguese jihadists in Syria. These concerns were mainly about their capacity to recruit or influence other people to commit suicide attacks. It has never happened in Portugal, but the millions of tourists all over the country, including some who avoid obvious targets such as Egypt and Tunisia, could still attract terrorists. In general, extreme organizations have used Portugal to escape from international authorities or finance their causes and not to commit attacks. 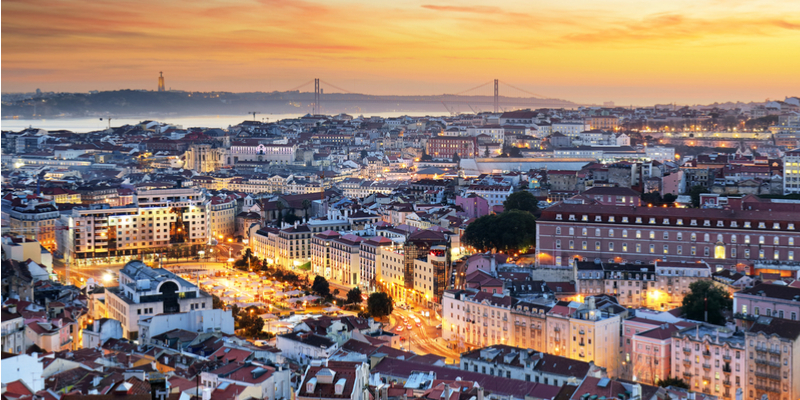 As a target, Lisbon is simply not as attractive as Paris or London. But the high value of tourist business has compelled the authorities to invest in security measures. Portuguese people were not used to seeing groups of armed police officers on the streets, but now it happens almost every day, especially after the Ramblas attacks last year. After all, Barcelona is just a ten hour drive from Lisbon.